The immense popular success of Carmina Burana has, in a certain way, shadowed its composer. Carl Orff’s stylistic evolution didn’t stop at Carmina Burana. Rather, it started there (all the more so as he withdrew nearly all his previous compositions, considering Carmina as his opus 1), and ultimately brought him to a more radical outlook. Orff increasingly shifted towards music theatre, and even pure theatre, compositions in which the music was more and more subservient and the spoken word took prominence. He also radically pared down his orchestrations, leaving out most of the orchestra and tending to limit himself to percussion (with piano as percussion instrument), following a path first trodden by Stravinsky in Les Noces. In 1949, with Antigonae (the composer was 54 then), the evolution was complete, and Orff didn’t budge much stylistically thereafter. De Temporum Fine Comoedia, his last stage work, composed almost a quarter century later, isn’t very different (see my review of Karajan’s recording on DG). 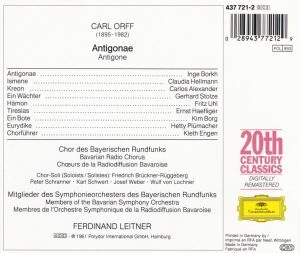 Antigonae, premiered in Salzburg under Ferenc Fricsay (recording available on Stradivarius STR 10060, barcode 8011570100603), was in fact the first in a trilogy of Greek Tragedies, the others being Oedipus der Tyrann (1959, also available in DG’s “20th Century Classics” collection, 437 029-2, barcode 028943702928, conducted by Rafael Kubelik) and Prometheus (1968, the most “legitimate” version would be Ferdinand Leitner’s with the Cologne Radio Symphony Orchestra in 1972, first CD-released on Acanta 44 2099-2, barcode 036244209923). The latter is after Aeschylus’ Prometheus Bound and there Orff set to music the original Greek language, but in the two Sophocles tragedies he used the famous translations made by the 19th Century poet Friedrich Hölderlin. Orff didn’t call Antigonae and the two other compositions in the series “operas”, but rather “Vertonungen”, settings to music, and that’s what they are: Orff’s attempt to recapture, in a contemporary music language, what the original Tragedy might have sounded like in the ancient times: a combination of declamation and singing (by soloists and men’s chorus) with sparse, percussion accompaniment. It is the complete Sophocles/Hölderlin text that Orff sets to music, with not a single cut. Consequently, the composition is, in this recording, 20 minutes short of three hours. The soloists alternate between dramatic declamatory Sprechgesang (either freely spoken or rhythmically pulsed, as in track CD1/2) and dramatic singing with usually sparse percussive support, making it sound almost a capella. That kind of rhythmic speech is also given to the chorus (as in CD 1 track 4), reminding me of what Milhaud invented in his early and radical works from the 1920s, such as Les Choephores (also part of a Trilogy of Greek tragedies by the way, here the Agamemnon-Elektra-Orestes story after Aeschylus). As mentioned, the “orchestral support”, quasi limited to pianos (six are required) and a huge array of percussion, is always lean and sparse, in the form either of interjections or pulsating ostinatos. There are also 9 double basses, which enter as late as CD2 track 2 (end of act II), in a very sparse oscillating funeral ostinato on two notes, and for no longer than a few seconds: hard to be more minimal. The 4 harps are first used still later (track 3), again in ostinatos. The pianos are used for their percussive qualities, alla Stravinsky, and usually at the extreme of their registers, either a low rumble or drum-like pounding, or chiming and tinker-belling in the high notes (try the beginning of CD1 track 2). 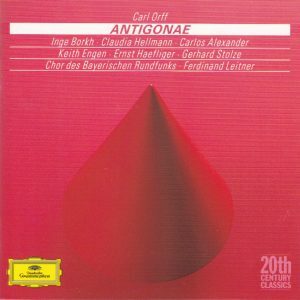 There are many arresting and ear-catching moments, such as CD 1 track 3, where you hear the rhythm so typical of Rheingold’s famous anvil music, but as if played on a tape running at twice the speed (pianos playing in prestissimo the upper registers). Antigonae was written 20 to 30 years before any repetitive music of Glass, Reich and Ten Holt, but it’s all there, at the service of a powerful drama. CD 1/8 at 1:55 there is a playfulness that strongly echoes Stravinsky’s Les Noces. Something of the boisterous and wordly atmospheres of Carmina Burana can be heard in the chorus songs, CD2/3 and CD3/2. Hämon has beautiful tunes to sing in Act III, and the flutes (there are six, doubling piccolo) erupt as late as CD2/7, at the end of a beautifully pastoral chorus (“spirit of love…”). Harps are used to great coloristic effect in CD3/3. And I’m not sure what instrument I hear whining in CD3/3 – oboes? (otherwise I confess to not having spotted them). Finally, if my ear is right, trumpets (and oboes?) come in only at the end, in the violent and dramatic orchestral outburst CD3/7. The cast, led by Inge Borkh’s mighty and dramatic Antigone, is stellar (Claudia Hellmann as Ismene is a bit strained though) and the interpretation, made in the presence of the composer, is authoritative. The 1961 sonics have great presence, with almost no tape hiss even. Of all the stage works of Orff that I have heard (and that includes the two others in the Trilogy, the final De Temporum Fine Comoedia, and the two Fairy-tale operas, “Die Kluge” and “Der Mond“, [[ASIN:B0000035PI Orff: Die Kluge/Der Mond]]), this is, I find, the most rounded masterpiece, because it is the one that is most radical in its music and the one that reaches the better balance in terms of mixing text and music. Yet, two provisos: one, as ear-catching as the percussion orchestra may be, it comes only in spurts, there are lengthy stretches of unaccompanied singing or sprechgesang; this is dramatic but austere stuff that won’t send you dancing the French can-can. Two, the booklet does not provide the text, just a detailed synopsis, making it more tedious to follow. Remember: this is not Baroque or Romantic opera, where the details of the words may not be as important as the general idea and the gorgeous melodies. This is, in essence, music theatre, theatre set to music, and comprehension of the words is essential. But I’ve found a German website providing the Hölderlin translation (link will open a new tab), and English translations are available everywhere: search “Sophocles Antigone”.